Hello. We are Sean Mongey and Jennifer Macpherson, Owners of Mathnasium of Kitchener, your neighbourhood math-only learning centre. We help kids in grades Grades 2-12 understand math by teaching the way that makes sense to them. Since we opened our doors in 2018, Mathnasium of Kitchener has been helping students in the community increase their confidence in math. We are located on Fairway Road South. Come and visit us at the Centre for a FREE Trial and see how we can help your child become CRAZY about math! Sean and his staff at this location are all great to deal with and very professional and approachable. My daughter is not a math lover but I like that I don't have to drag her here for tutoring. We've really noticed an increase in her confidence in the subject over the past 5 months. This location is also always clean and organized. The environment is suitable for learning in terms of not being cluttered or noisy. The staff and owner in Kitchener is very patient and understanding of my child's feelings and frustrations over her need for help and getting stuck on questions. They helped to build confidence in the knowledge she already had and showed her how to use it to work through problems on her own. They have a reward program and special treats that for the children to make it more fun and encourage then to come back even after a difficult or frustrating day. I would recommend the Kitchener Fairway location for anyone to bring their child. My daughter has experienced issues with other math tutoring centres and quickly gets upset, saying she doesn't want to go anymore. But since we started at Mathnasium, she has enjoyed going several times and week and often looks forward to it. We have been going for nearly a year now and she still is just as excited to go as she was in the first few weeks. Their program has significantly helped her math skills and has helped her feel comfortable in a classroom setting, which is something she has difficulties with. We would highly recommend the Mathnasium program and especially the Kitchener location. Excellent results in a very short timeframe. My son is in grade 9 and is NOT an academic! With his math marks being less than stellar, he reluctantly agreed to try Mathnasium. While he never suggests going, he doesn't resist and always leaves his sessions a happier, more confident guy. Just recently, he was bragging that he now helps the other kids in his class! The team at Mathnasiumon Fairway is very friendly, welcoming, and capable. I highly recommend them. Great staff, very friendly and approachable I don’t have to force my child to go as she enjoys it! The pizza nights, spinning the wheel and earning rewards also make it fun and provides a sense of accomplishment. They understand my kids needs and are very helpful whenever they they help. Our kids have been in Mathnasium for about 2 months now. Their teachers have already noticed improvements in their math skills. We notice that they are much more confident and able to apply math in real life scenarios. As a parent, I would definitely recommend this program. I had a great experience with you guys. Staff was friendly and very helpful. We love Mathnasium and how it challenges our kids to explore math in a fun and creative way. We have recommended Mathnasium to several friends. 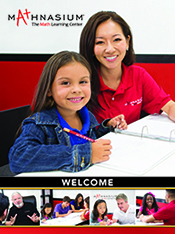 We like that the tutors approach our two children as the unique individuals they are, with different strengths and learning styles. It doesn't hurt that our kids never complain that they're going to Mathnasium! This the best Centre . Our child start getting 100 percentage after learning from Kitchener Mathnasium . I will say it was unbelievable experience. I did see improvement from my child after a few sessions here. I'm very happy with the result. The staff is awesome and patient with our kids. I love the feedback and encouragement provided. we had a amazing working experience with owner and staff . Excellent customer service . Very friendly and professional atmosphere . My daughter absolutely loves this place!! She never complains about going and often asks to stay longer when I arrive to pick her up! The tutors our amazing and very patient with her. Aswell the owner Sean is always happily greeting us when we walk through the door! The amount of confidence my daughter has developed towards math is all because of the wonderful people at this center.well worth it! Thanks to the staff at mathnasium, not only are our kids advancing in math, but they are having fun doing it!! We are so happy with the decision to join Mathnasium of Kitchener! Mathnasium helped my daughter get her confidence back, which helped to motivate her to not give up when math got hard. My daughter Kai-ya absolutely loves coming here!! I never ever have to force her and she is learning so much. Everyone at the center is so kind and patient with her.. She is extremely motivated by the learning curriculum and most important is having fun while she learns.. She used to shy away from math at school and now has so much more confidence in the classroom! !